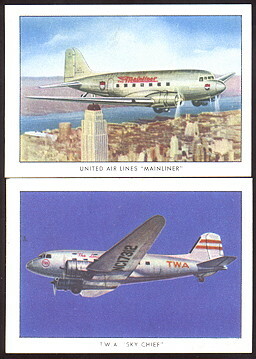 This page features Wings Cigarettes cards from 1940-1942, (T87). 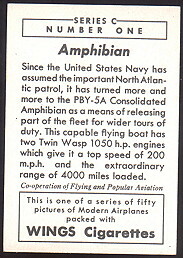 There were three series of these, A,B, & C. There are 50 cards in each series measuring 2-1/2" X 1-1/2". 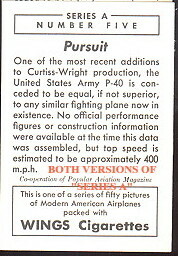 The first series can be found with or without the "Series A" on the back. 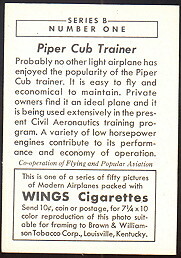 Card with "Series A" on the back are more scarce. 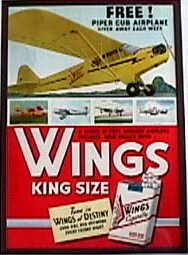 Back in 1940 Brown & Williamson Tobacco corp sponsored a radio program "Wings of Destiny". These cards were originally issued with their tobacco products in conjuntion with the show. They were collected with albums, and usually were glued, or stapled to them, damaging the cards.